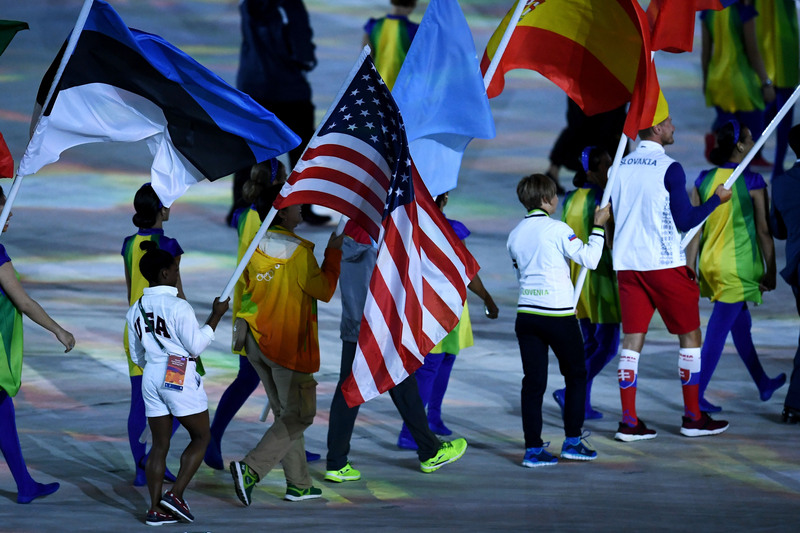 The role of flag bearer is reserved for America's top athlete at the event. That title technically went to Michael Phelps this year, as he closed out Rio with six medals (five gold, one silver), but Phelps carried out the task during this year's opening ceremonies. Biles won five medals, four of them gold, in women's gymnastics in Rio, with many calling her the best in history. She certainly earned the honor of representing her country — though she was reportedly nervous to do so, telling USA Today in an interview, "I’m afraid the flag is going to be too heavy for me ... Michael Phelps is so much taller and he seemed to carry it so easily, and I’m very short. So I’m a little worried about that part." Phelps is 6'4" and Biles is 4'8" — and her small stature is confirmed in one amazing photo circulating from the closing ceremonies. There stands Biles, one of the best athletes in the world, holding a flag that appears to be far taller than she is. There stands one of the most determined athletes on the planet. What is so striking about this photo is that it captures both Biles' smallness and her enormity. She is tiny, but she is mighty — so mighty, in fact, that she may be the greatest female gymnast of all time. In this photo, she looks like a kid in a sea of seasoned athletes. But she is one of the greatest athletes in that entire arena. But there is so much power packed in that petite person it's truly remarkable — don't let her looks deceive you.